A naïve human typing simulation effect. Written quickly to scratch an itch; not intended to be an accurate algorithm. Watch the demo to see what it does. Point your camera at things to hear how to say them in a different language. Thing Translator is an open-source app that demonstrates the simplicity and charm of harnessing modern machine learning techniques – namely, computer vision and natural language translation. You can watch a video explaining how it works here. It was built with some friends at Google Creative Lab as part of the A.I. Experiments series. Fold the DOM up like paper. The web is flat, but with OriDomi you can fold it up. OriDomi is an open-source paper-folding library with animation queueing, touch support, and zero dependencies. Visualize relative wealth in graspable terms. Gilded Gauge is an experiment in visualizing relative wealth in terms viewers may find more natural to grasp. Enormous numbers become tangible via comparisons to the Fall of Rome, the distant future, and cascades of emoji commodities. Each falling menagerie represents an exact representation of the value in question, down to the exact dollar. Gilded Gauge is entirely open source. Capture one second moments as animated gif mosaics. Pozaic uses WebRTC to connect friends (or strangers) in live video compositions you can turn into animated gifs. The medium captures a single second in time across geographic gaps. Remove GPS data from your photos before you share them online. EXIF is a type of metadata that is embedded in photo files from most types of cameras and phones. This metadata includes information about the device used to capture the photo, but also often includes the GPS coordinates of where the photo was taken. Many users unknowingly share this information with the general public and site/app owners when uploading photos online. This has been a common vector of privacy lapses, including cases where journalists have unintentionally published photos with geotagging data intact. Recent press has also revealed the NSA’s collection of EXIF data in its XKeyscore program. ExifExodus is a small piece of open-source code that runs directly in your browser and strips EXIF data out of your photos before you upload them. When ExifExodus encounters a JPG file, it will remove the EXIF data by copying the pixels to a new image file, similar to taking a screenshot of something. Alternatively, you can drop your files in the dropzone at the top of the site) and receive versions free of EXIF data. You can then save these new files and upload them wherever you’d like. That’s certainly not the implication of this project. Metadata adds another dimension to photos and is valuable for preserving context. This project aims to educate and give users a choice in the matter of sharing it with specific services (and the web at large). Doesn’t Facebook (etc.) remove EXIF data before displaying photos? Yes. Although this prevents the general public from accessing your EXIF data, you should be aware that the end recipient is free to use or store the metadata before removing it. The ExifExodus bookmarklet won’t work with any site that uses Flash (or any other proprietary plugins like Silverlight) to upload files. For such sites, use the dropzone converter, save the output files, and upload those instead. ExifExodus only works with JPG files (which is the most common image format to carry EXIF metadata). Cellf is an interactive experiment that reflects you and your surroundings as you play. More simply put, it’s a twist on sliding tile games written in ClojureScript, React (via Om), and core.async. The simple habit building app for iPhone. Set daily goals and visualize your progress in an intuitive and visual way. Motivate yourself to adopt new positive habits one day at a time. Transform arrays of any length into cubes that can be rotated infinitely. Originally developed as the time picking interface for ChainCal, I expanded it to visualize arbitrary arrays and wrote an article detailing the process on Codrops. Add some diagonal rhythm to your elements. Skew the shapes of elements without distorting their contents. Maskew creates a parallelogram mask over the element and supports touch/mouse manipulation of the skew amount. Bootstrap ClojureScript-based React Native apps. Natal is a simple command-line utility that automates most of the process of setting up a React Native app running on ClojureScript. It stands firmly on the shoulders of giants, specifically those of Mike Fikes who created Ambly and the documentation on setting up a ClojureScript React Native app. Before getting started, make sure you have the required dependencies installed. If your app’s name is more than a single word, be sure to type it in CamelCase. A corresponding hyphenated Clojure namespace will be created. Keep in mind your app isn’t limited to the React interfaces Natal provides templates for; these are just for convenience. If all goes well your app should compile and boot in the simulator. From there you can begin an interactive workflow by starting the REPL. (If you don’t have rlwrap installed, you can simply run natal repl, but using rlwrap allows the use of arrow keys). If there are no issues, the REPL should connect to the simulator automatically. To manually choose which device it connects to, you can run rlwrap natal repl --choose. Changes you make via the REPL or by changing your .cljs files should appear live in the simulator. When the REPL connects to the simulator it will begin to automatically log success messages, warnings, and errors whenever you update your .cljs files. Having rlwrap installed is optional but highly recommended since it makes the REPL a much nicer experience with arrow keys. Don’t press ⌘-R in the simulator; code changes should be reflected automatically. See this issue in Ambly for details. Running multiple React Native apps at once can cause problems with the React Packager so try to avoid doing so. You can launch your app on the simulator without opening Xcode by running natal launch in your app’s root directory. By default new Natal projects will launch on the iPhone 6 simulator. To change which device natal launch uses, you can run natal listdevices to see a list of available simulators, then select one by running natal setdevice with the index of the device on the list. To change advanced settings run natal xcode to quickly open the Xcode project. The Xcode-free workflow is for convenience. If you’re encountering app crashes, you should open the Xcode project and run it from there to view errors. You can run any command with --verbose or -v to see output that may be helpful in diagnosing errors. As Natal is the orchestration of many individual tools, there are quite a few dependencies. If you’ve previously done React Native or Clojure development, you should hopefully have most installed already. Platform dependencies are listed under their respective tools. You can get the latest version of Natal by running npm install -g natal again. Om Next app with Python server by David Mohl, demonstrated in a talk at the Tokyo iOS Meetup. Zooborns by Jearvon Dharrie, demonstrated in a talk at Clojure/conj 2015. For more ClojureScript React Native resources visit cljsrn.org. If you’re looking for a simple ClojureScript wrapper around the React Native API, check out the companion library Natal Shell. It is included by default in projects generated by Natal. Divine auspices from Git log hashes. Every Git repository is full of latent omens waiting to be divined through complex Lisp augury. 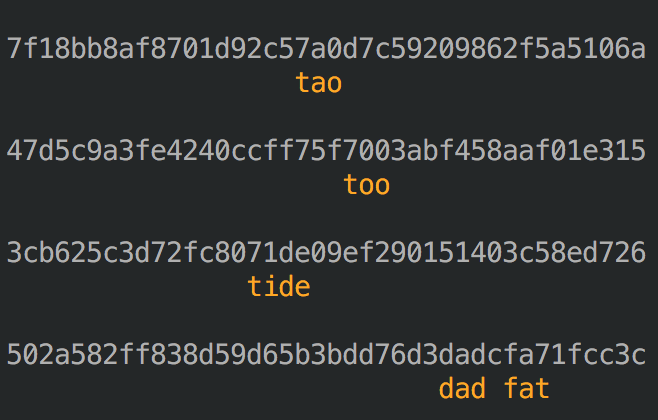 Tasseographer scours commit log hashes and cross references words in /usr/share/dict/words. A thin ClojureScript wrapper around the React Native API. Natal Shell is a simple convenience wrapper around the React Native API, offering a simple Clojure-ready interface out of the box. It is designed as a companion library to Natal (a command line utility for quickly bootstrapping React Native projects in ClojureScript), but can be used completely independently. The same rule applies to API methods. A red screen with a stack trace will be shown, making it easier to realize where something’s gone awry. Natal Shell is automatically generated from scraping the React Native docs via the script in scripts/scraper.clj. Future areas of improvement may include optionally omitted prop arguments and automatic conversion of snake-case keys in maps. // => Taxa: Expected number as argument 0, given string (3) instead. Unlike other projects of this nature, Taxa is purely a runtime type checker rather than a static analyzer. When a Taxa-wrapped function receives or returns arguments of the wrong type, an exception is thrown. Taxa type signatures are intended to be quick to type and to occupy few additional columns in your code. Following this spirit of brevity, examples are also shown in CoffeeScript as it’s a natural fit to Taxa’s style. A type signature is composed of two halves: the argument types and the return type, separated by a space. # => Taxa: Expected string as argument 0, given number (7) instead. // => Taxa: Expected string as argument 0, given number (7) instead. The above function is expected to take two numbers as arguments and return a third. For polymorphic functions that accept different types of arguments, you can use the | character to separate types. For each argument and return type in the above function, either a number or a string is accepted. Since all non-primitive types are objects, specifying o in your signatures will of course match complex types as well. However, passing a plain object or an object of another type to a function that expects a specific type (e.g. WeakMap) will correctly throw an error. Keep in mind that Taxa is strict with these signatures and will not walk up an object’s inheritance chain to match ancestral types. Like any other function, those annotated with Taxa carry a bind method, which works as expected with the additional promise of modifying the output function’s Taxa signature. Under the covers, add2‘s type signature was changed to n n.
You can disable Taxa’s type enforcement behavior globally by calling t.disable() (where t is whatever you’ve aliased Taxa as). This will cause calls to t() to perform a no-op wherein the original function is returned unmodified. This is convenient for switching between environments without modifying code. Its counterpart is naturally t.enable(). Take a look at the test cases in ./test/main.coffee for more examples of Taxa signatures. When a function is modified by Taxa, its arity is not preserved as most JS environments don’t allow modifying a function’s length property. Workarounds to this problem would involve using the Function constructor which would introduce its own problems. This only has implications if you’re working with higher order functions that work by inspecting arity. It should go without saying, but this library is experimental and has obvious performance implications. Taxa is young and open to suggestions / contributors. From the Ancient Greek τάξις (arrangement, order). Event emitter for watching text streams with regex patterns. stream-snitch is a tiny Node module that allows you to match streaming data patterns with regular expressions. It’s much like ... | grep, but for Node streams using native events and regular expression objects. It’s also a good introduction to the benefits of streams if you’re unconvinced or unintroduced. The most obvious use case is scraping or crawling documents from an external source. Typically you might buffer the incoming chunks from a response into a string buffer and then inspect the full response in the response’s end callback. Of course, the response could be enormous and bloat your data buffer. What’s worse is the response chunks could come slowly and you’d like to perform hundreds of these download tasks concurrently and get the job done as quickly as possible. Waiting for the entire response to finish negates part of the asynchronous benefits Node’s model offers and mainly ignores the fact that the response is a stream object that represents the data in steps as they occur. The image download tasks (represented by fn) can occur as sources are found without having to wait for a potentially huge or slow request to finish first. Since you specify native regular expressions, the objects sent to match listeners will contain capture group matches as the above demonstrates (match). For crawling, you could match href properties and recursively pipe their responses through more stream-snitch instances. stream-snitch is simple internally and uses regular expressions for flexibility, rather than more efficient procedural parsing. The first consequence of this is that it only supports streams of text and will decode binary buffers automatically. Since it offers support for any arbitrary regular expressions including capture groups and start / end operators, chunks are internally buffered and examined and discarded only when matches are found. When given a regular expression in multiline mode (/m), the buffer is cleared at the start of every newline. stream-snitch will periodically clear its internal buffer if it grows too large, which could occur if no matches are found over a large amount of data or you use an overly broad capture. There is the chance that legitimate match fragments could be discarded when the water mark is reached unless you specify a large enough buffer size for your needs. If you want to reuse a stream-snitch instance after one stream ends, you can manually call the clearBuffer() method. It should be obvious, but remember to use the m (multiline) flag in your patterns if you’re using the $ operator for looking at endings on a line by line basis. If you’re legitimately looking for a pattern at the end of a document, stream-snitch only offers some advantage over buffering the entire response, in that it periodically discards chunks from memory. Pipe audio streams to your ears. ear-pipe is a duplex stream that allows you to pipe any streaming audio data to your ears (by default), handling any decoding automatically for most formats. You can also leverage this built-in decoding by specifying an output encoding and pipe the output stream somewhere else. ear-pipe relies on the cross-platform audio utility SoX, so make sure that’s installed first. When arguments are omitted (e.g. ep = new EarPipe;), the type defaults to 'mp3', the bitrate defaults to 16, and the third argument is null indicating that the pipe destination is your ears rather than a transcoded stream. If your connection and speakers work, you should hear it as it downloads. Since only one chunk passes through at a time, this DJ set should have plenty of cuts. Kill an ear-pipe instance by calling its kill() method. If you’re interested in the underlying SoX process, access an instance’s .process property. Output recursive directory stats as JSON for visualization and analysis. When used as an executable, statmap returns JSON over stdout. The JSON will contain a recursive representation of the directory and all children. Each key is a file or directory name with a corresponding value containing a stats object and a children object if it is a directory. Directories also are also given a sum property which reflects the size of all children recursively, unlike the typical size property of directory’s stats object. Using this data, you could create something like a D3 zoomable treemap of your hard drive. When used as a library, a live object is returned rather than a JSON string. Web workers lose their chains: Easy threads without separate function files. Commune.js makes it easy to run computationally heavy functions in a separate thread and retrieve the results asynchronously. By delegating these functions to a separate thread, you can avoid slowing down the main thread that affects the UI. Think of it as a way to leverage the web workers API without ever having to think about the web workers API. Using straightforward syntax, you can add web worker support to your app’s functions without the need to create separate files (as web workers typically require) and without the need to change the syntax of your functions. Best of all, everything will work without problems on browsers that do not support web workers. I will appear before the loop finishes. I probably will too, depending on how fast your CPU is. With Commune.js, we could proceed with our work in the main thread without waiting to loop 100 million times. Running the above in a browser with worker support, you’ll see the results of each function call appear simultaneously, meaning that none of these large loops had to wait for the others to finish before starting. Using Commune.js with care, you can bring asynchronicity and parallelism to previously inapplicable areas. When you pass a new function to Commune.js, it creates a modified version of the function using web worker syntax. Commune.js memoizes the result so additional calls using the same function don’t have to be rewritten. Just write your functions as you normally would using return statements. Commune.js automatically creates binary blobs from your functions that can be used as worker scripts. Since web workers operate in a different context, you can’t reference any variables outside of the function’s scope (including the DOM) and you can’t use references to this since it will refer to the worker itself. For functions you want to use Commune.js with, use a functional style where they return a modified version of their input. Also, since this is an abstraction designed for ease-of-use and flexibility, it does not work exactly as web workers do – namely you can’t have multiple return events from a single worker. Internally reroute non-AJAX requests to your client-side single page app router. Let’s say you have a modern single page web application with client-side URL routing (e.g. Backbone). Since views are rendered on the client, you’ll likely use RESTful Express routes that handle a single concern and return only JSON back to the client. The app’s only non-JSON endpoint is likely the index route (/). So while /users might return a JSON array when hit via the client app’s AJAX call, you’ll want to handle that request differently if the user clicks a link from an external site or manually types it in the address bar. When hit in this context, this middleware internally redirects the request to the index route handler, so the same client-side app is loaded for every valid route. The URL for the end user remains the same and the client-side app uses its own router to show the user what’s been requested based on the route. This eliminates the tedium of performing this kind of conditional logic within individual route callbacks.